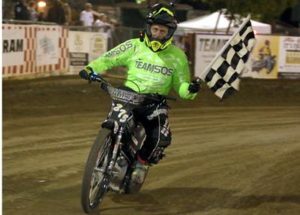 Nine weeks into the 2018 Fast Fridays Motorcycle Speedway season only two men have been able to win the scratch main event. The scratch main event is the last race of the night and the winner is proclaimed the fastest man of the night. The scratch main event puts the four fastest riders of the night into one final race scratch race off the line. 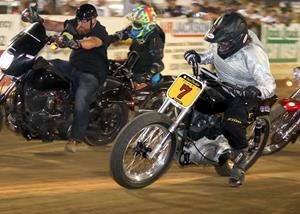 National champion Billy Janniro has won six scratch main events and Bart Bast has won three including the scratch main event last Friday. In the scratch program Bast was first in his heat race and second in his semi-final working his way into the scratch main event. He faced Janniro, Bryan Yarrow and Tommy Hedden. Bast was out of lane two and hit turn one first, Janniro out of lane one was second right behind Bast. Bast was able to keep ahead of Janniro who tried to pass on the deeper track outside but was unable to get by Bast. By lap 3 Bast was pulling away from Janniro a little at a time until he crossed the finish line. Yarrow, just behind Janniro passed him on lap four to take second place. Janniro was third, Hedden fourth. “We were side by side and I just tried to ignore him (Janniro), I just rode my own race and hoped for the best,” said Bast. Bryan Yarrow was the winner of the handicap main event. It was his first main event win of the season. Yarrow is handicapped off the 50-yard line. Bart Bast also handicapped off the 50-yard line was second and Janniro off the 70-yard line was third. 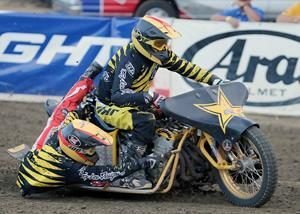 In their third of five visits to Auburn’s Fast Fridays the Extreme Sidecars were greeted by a full house of die-hard sidecar fans filling The McCann Stadium at the Gold Country Fairgrounds in Auburn. 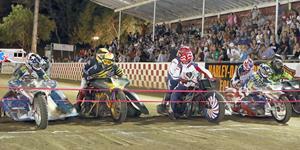 The five teams of three wheeled motorcycle daredevils did not disappoint the crowd with their special brand of rough and tumble motorcycle racing. The team of Smylie Kinne and Jeff Powell won the main event. 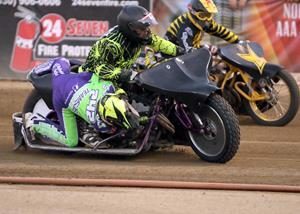 Joe Jones and Chuck Heider were second and Ace and Kevin Kale, a new sidecar team visiting Fast Fridays for the first time finished third. “Joe Jones does not make many mistakes, our plan was to tuck in next to him off the line and wait there,” Kinne said. “If he makes a mistake we would get a shot, after all the banging and beating tonight it worked out great.” The Extreme Sidecars will make their next appearance August 3rd. 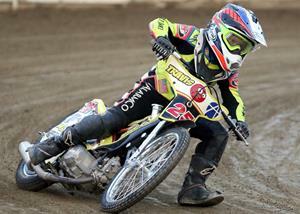 Charlie Haines picked up his first main event win this season in Division II. Shawn Eldredge was second and William McCloskey was third. McCloskey also won the trophy dash. Jake Estes is on a roll in Division III winning his second in a row main event. Estes was perfect Friday night winning his heat race then moving on to win the main event. Estes starts on the 10-yard line and this week’s win will likely move him back another 10 yards this coming Friday. Casey Cornilsen was second and LC Veale was third. Landon Norton ran away in the Youth 250cc program with a perfect night with wins in his two heat races and the main event. Anthony Dion was second and Landon Collins was third in the main event. Timmy Dion won the 250cc consolation main. 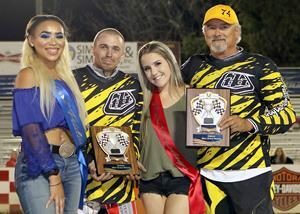 Travis Horn, again making the miles from Southern California count at Fast Fridays won his third in a row Youth 150cc main event. Already on the 40-yard line for starts, Horn might just find himself back another 10 yards this coming week. Mason Zebroff was second and Colton Nelson was third. This Friday night is a night to not be missed. 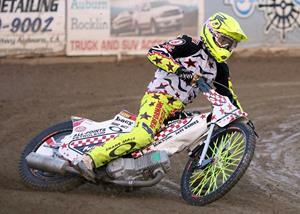 Along with a fantastic adult program, Fast Friday’s is hosting the AMA Youth 250cc and 150cc National Championships. The best youth riders in the nation will meet in Auburn to decide who will be this year’s national champions. 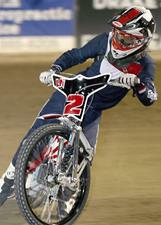 Southern California’s Travis Horn has won the Youth 150cc main event three weeks in a row. On the winner’s podium Jeff Powell (left) and Smylie Kinne (right) celebrate their first main event win at Fast Fridays with the Fast Fridays trophy girls. 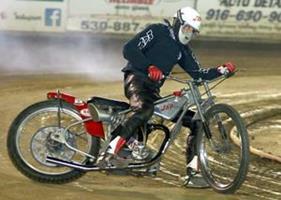 Smylie Kinne and Jeff Powell won the Extreme Sidecar main event. 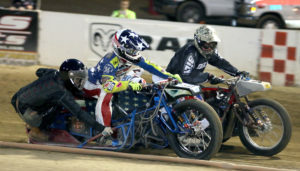 The start of the Extreme Sidecar main event. The team of Smylie Kinne and Jeff Powell (second from left) won the main event. Bryan Yarrow won the handicap main event, his first main event win this season. 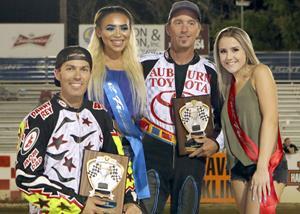 Bryan Yarrow (left) and Bart Bast (right) on the winner’s podium with the Fast Fridays trophy girls.